One of the big reasons for the success and popularity of Charles Barkley is he’s such a good sport when he faces personal joking and kidding. Compared to say, Shaquille O’Neal, who seems always wanting to beat up someone. Big guys never can take a joke. The TNT broadcast crew has a favorite gimmick for Barkley. They give Barkley five names and ask him to name which team they play for. I have to admit I don’t usually get them all while Barkley usually gets one or two. So with the NBA trading deadline day Thursday, can you identify which team these players played for prior to being traded Thursday? Turner should fit in with the Pacers well as a small forward who can handle the ball. Probably better than their point guard, George Hill, giving them another playmaker with Paul George and a 6-7 small forward to throw at LeBron James. They were some of the main players in what was a day of basically not changing the balance of power in the NBA. But there was one intriguing deal and it will be the subject of anticipation when it comes to the playoffs. I liked the trade for the Indiana Pacers and consider them the big deadline day winner. That deal was the Pacers’ Danny Granger, who remains slowed returning from injury, to the 76ers for Evan Turner and LaVoy Allen. Allen is another body you can throw out there and will make a shot. But Turner is the intriguing addition. The former No. 2 overall pick from Ohio State and St. Joseph’s High School in Westchester has been having a career year on the NBA’s worst team, which is getting worse after also trading Spencer Hawes to the Cavs for some Big Mac secret sauce. Or bad draft picks. The 76ers had to take back a contract, so they got Earl Clark and Henry Sims. Bet you didn’t know where Sims was. The 76ers general manager, Sam Hinkie, is a protégé of Houston general manager Daryl Morey, who stockpiled draft picks with the plan of eventually turning them into a star. He actually did, though more by blind luck after a dozen or more go nowhere deals when the Thunder failed to realize they could have kept James Harden the rest of the season without it costing them luxury tax. But you get the deal and you are a star. We’ll see if it works again. Or ever. Anyway, Turner should fit in with the Pacers well as a small forward who can handle the ball. Probably better than their point guard, George Hill, giving them another playmaker with Paul George and a 6-7 small forward to throw at LeBron James. Plus, it’s nice insurance if they cannot or decide not to resign free agent Lance Stephenson, who figures to command much more money than Turner. There’s some question about chemistry given Granger has been a Pacers’ mainstay. But it’s a team with strong character that will move on as the Bulls did despite losing Luol Deng. The Bulls were, as expected, quiet after probably making the biggest move of the trading season by sending Deng to the Cavs last month. It’s worked out terribly for Deng, who even was being dangled in trade by the Cavs as they’ve begun to play well. Lost in Mike Brown’s unimaginative offensive system, the Cavs story was uncertainty about resigning Deng. But how did that change since they got him a month ago? They may have decided not to pay him with a new general manager on board and they found what the Bulls did, that you don’t get a No. 1 pick for a rental player. So it will be interesting to monitor Deng’s free agent value if the Cavs don’t believe he is necessary now with them trying to make a playoff push. Winner No. 2 is the Bobcats. Mike’s back! They acquired Luke Ridnour and Gary Neal, two guards who can shoot for a team that has trouble scoring. The Bucks took back Ramon Sessions to basically save money. It’s a boost for the Bobcats making the playoffs, which would send the Bulls their draft pick from the Tyrus Thomas trade. Winner No. 3 is the Cavs with the Hawes addition. He’s also having a career year, again which is suspicious when your team is so horrible. But he’s a good shooting big man who can support the return of Anderson Varejao and give them ample depth up front in a playoff chase. This trade deadline was more about teams on the edge trying to get into the playoffs rather than any major deals. As expected, none of the big name players mentioned in the last few months, like Carmelo Anthony, Rajon Rondo, Pau Gasol, Jeff Green, Josh Smith, Kevin Love, Kyle Lowry, Iman Shumpert (big name? 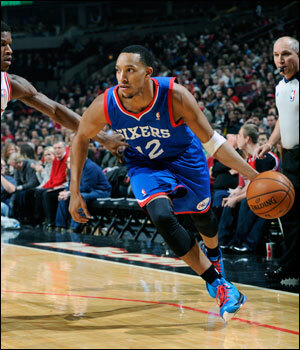 ), Omer Asik (big man) or Eric Gordon were involved. Winner No. 4 is the Wizards, though short term. They had to give up on 2011 No. 6 overall pick Jan Vesely, but they basically had, anyway. They get the banished-to-the-Rocky Mountain gulag Andre Miller. Though slowed some, but rested, Miller should provide some stability and resolve the late game panic too often shown by the Wizards’ young backcourt. The question will be minutes played with John Wall and Bradley Beal. But they have been looking for a crunch time decision maker and perhaps he’ll be able to play some of those crucial minutes and remind them a team that hasn’t made the playoffs in this presidential administration shouldn’t be taking anyone lightly. The losers were probably guys like Granger, who could pursue a buyout and join a playoff team. He cannot return to Indiana. Would he go to Miami? And hit a big shot late to beat them? That would be too cruel. Deng probably joins that loser group as Cleveland gets another scorer, which surely will make Mike Brown’s head hurt. Plus everyone going to the 76ers. Is tanking trying to overtake the league’s worst team, the Bucks, when you are second worst? The Warriors’ move for Steve Blake is solid, though Kent Bazemore was a hard working, popular teammate. Blake should be marginal help for the guard heavy Warriors. Jason Terry going to the Kings also looks like someone who’ll be negotiating for a buyout in the next week. He’s got another season left after this, but he cannot be too happy finding his leader changed from Kevin Garnett to DeMarcus Cousins. It’s difficult to rate a Nets deal. They got a shooter in Marcus Thornton and took on more salary, of course. Their tax penalties are now in the billions. Thornton, though, is having a poor shooting season. But one request of Garnett going to Brooklyn was they sign Reggie Evans, who went to the Kings. Maynor was in Washington and was part of the Miller deal going to Philadelphia. Hamilton was in Denver going to Houston for Aaron Brooks. Daye was in Toronto going to San Antonio for Nando de Colo. Byron Mullens was with the Clippers and also went to the 76ers, who should have quite the roster the rest of the season. Brooks was with the Warriors and part of the Blake trade. The Kings saved some money getting Miami a roster spot, apparently for a pickup of a buyout player, for Roger Mason Jr. The Hawks got Antawn Jamison with rumors he could be bought out to save both teams money. Call that cash/cash instead of win/win. And so went trading deadline day 2014.